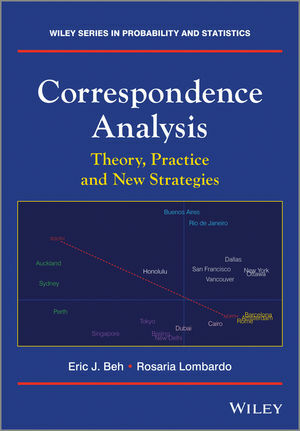 Correspondence Analysis: Theory, Practice and New Strategies examines the key issues of correspondence analysis, and discusses the new advances that have been made over the last 20 years. The main focus of this book is to provide a comprehensive discussion of some of the key technical and practical aspects of correspondence analysis, and to demonstrate how they may be put to use. Particular attention is given to the history and mathematical links of the developments made. These links include not just those major contributions made by researchers in Europe (which is where much of the attention surrounding correspondence analysis has focused) but also the important contributions made by researchers in other parts of the world. A comprehensive international perspective on the key developments of correspondence analysis. Discussion of correspondence analysis for nominal and ordinal categorical data. Discussion of correspondence analysis of contingency tables with varying association structures (symmetric and non-symmetric relationship between two or more categorical variables). Extensive treatment of many of the members of the correspondence analysis family for two-way, three-way and multiple contingency tables. Correspondence Analysis offers a comprehensive and detailed overview of this topic which will be of value to academics, postgraduate students and researchers wanting a better understanding of correspondence analysis. Readers interested in the historical development, internationalisation and diverse applicability of correspondence analysis will also find much to enjoy in this book.